At the heart of every great European city is a flourishing flower market. 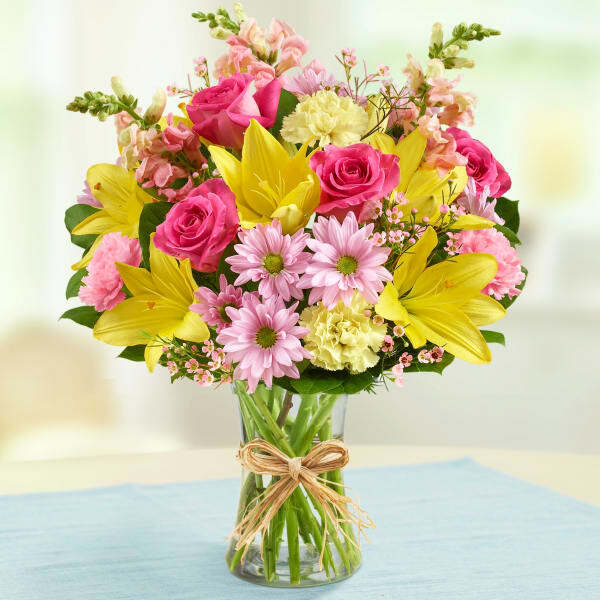 With gorgeous fresh roses, lilies, carnations, snapdragons and more, our bestselling field-gathered bouquet, designed in a glass vase and tied with raffia, this unique gift will let the family know you are sending your calm strength to them during these difficult times. • Gathering of roses, lilies, snapdragons, asters, carnations, waxflower and salal. Exactly what I was looking for!! 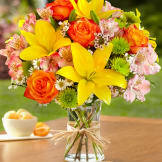 The flowers were bright and beautiful just like the picture. I'm always worried about purchasing on-line due to not receiving what I expected or the order not arriving on time. That was not the case, everything was perfect. I contacted the" live help" with questions and they were great!